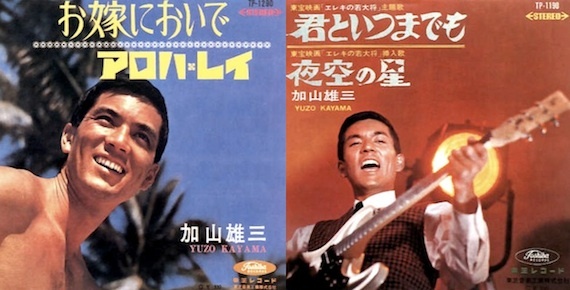 Google the name Yuzo Kayama and you’ll note that he’s “a Japanese popular musician and film star born in 1937. His father, Ken Uehara, was one of the most popular film stars in Japan during the 1930s. Yuzo himself became one of Japan’s biggest stars of the 1960s in the WakadaishÅ, or Young Guy film series, as an actor.” In short, Kayama was what you’d call a renaissance man. But in the span of the double header that is “Black Sand Beach” and “Violet Sky” none of that matters. Ease back and dig the following Japanese psych-surf jams from 1964. All I can say is, awesome find. Thanks for the MP3s. i knew i recognized his face- he plays the young protÃ©gÃ© in kurosawa’s red beard. these tracks are DOPE. thanks for the heads-up, AD! love the music. Couldn’t get to it on emusic, though. I have an account and it doesn’t show up in a search. Oh, these are killer – thank you! Yo AD! Muchas Gracias for these gems, loving it! I got a hold of the 10 album LP Black Sand Beach….so sick. Thanks for pointing me in this direction.